Mid to later 19th century, possibly including 1836 fabric. Single and 2-storey, 5-bay, L-plan, gabled former bank with conical-roofed entrance tower. Squared and snecked rubble lined to give appearance of ashlar, with ashlar dressings. String course and cornice to tower. Stepped hoodmoulds, stone mullions, raised and tabbed stop-chamfered margins. W (PRINCIPAL) ELEVATION: engaged tower in bay to right of centre with step up to hoodmoulded tall 2-leaf boarded timber door with flanking narrow lights, small window over door at 1st floor, also with flanking lights, decorative cast-iron weathervane finial to conical roof; single storey bay to outer right with hoodmoulded tripartite window and decorative bargeboarding in finialled gablehead. Bay to left of centre with hoodmoulded panelled timber door and flanking narrow lights in gabled stone porch, small bipartite window above; window to each floor in bay to right, that to 1st floor breaking eaves into finialled dormerhead; window to each floor or broad advanced finialled gable to left. S (TOBERARGAN ROAD) ELEVATION: single storey gabled elevation with hoodmoulded wide-centre tripartite window. N ELEVATION: symmetrical 8-bay elevation with 2 windows to each floor of outer gabled bays, that to right slightly advanced, and 2 further windows to each floor of centre bays. E (REAR) ELEVATION: variety of elements to irregular elevation including advanced wing to right and single storey bay to left. Lying 10- and 12-pane, and 4- and plate glass glazing patterns all in timber sash and case windows. Grey slates, fishscale pattern to turret roof. Coped ashlar stacks with polygonal cans. Overhanging eaves with decorative bargeboarding. INTERIOR: decorative plasterwork cornicing; part-glazed screen doors and mosaic tiled vestibules, that to tower with 'BANK OF SCOTLAND'. 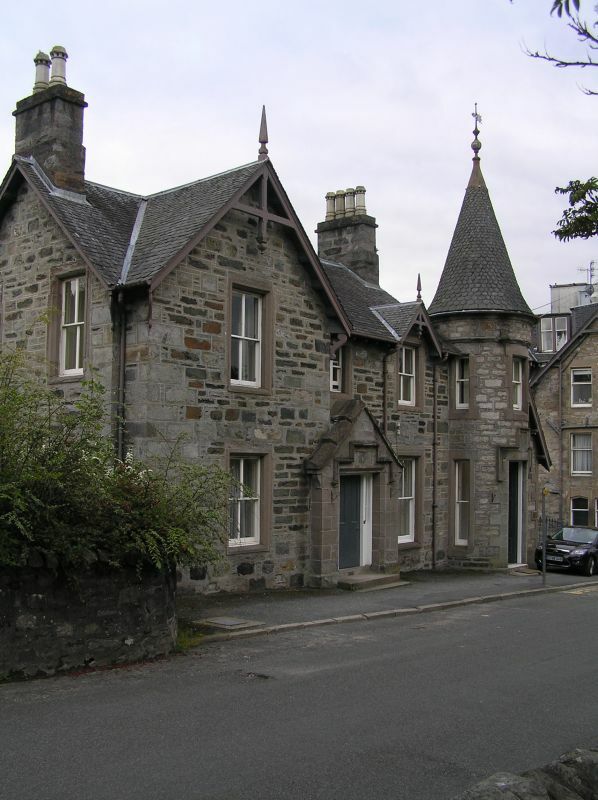 ANCILLARY BUILDING: slated and piended roof to rectangular-plan rubble ancillary with openings to W.
GATEPIERS, BOUNDARY WALLS AND RAILINGS: pyramidally-coped, stop-chamfered, square section, ashlar gatepiers and rubble boundary walls with inset decorative cast-iron railings to S.
The Bank of Scotland established a building on this site in 1836. Now an annexe of Scotland's Hotel.